The Peacock Bass is an aggressive member of the Perciformes (perch-like fish) order of fishes. 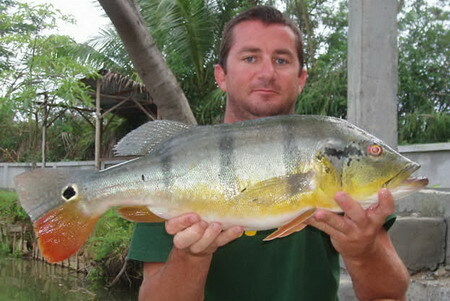 The Peacock Bass is limited in its range to parts of South America such as Suriname, French Guiana and Guyanna in the Amazon basin and is highly prized catch by recreational anglers from across the world. Peacock Bass occur in quiet waters and rapids preferably with rocky substrates where it aggressively hunts small prey fish such as Tilapia, threadfin shad, mosquito fish and Blue Gill. The Peacock Bass is a striking member of the Cichlidae family of fish which displays vibrant green or yellow colours throughout its streamlined flanks which are interspersed with thick black lateral bands. The lateral banding adorning the flanks of the Peacock Bass has been observed to fade late in adulthood. This highly adapted predator is equipped with large predatory red eyes which keenly seek out prey fish in the murky waters that it inhabits. The Peacock Bass is an easily identified freshwater fish which can be distinguished by a curious eye spot located near the base of its tail which is designed to ward off any attacks by other larger predator fish. With its vibrant and elaborate colouration and striking eye spot the Peacock Bass is one of the most colourful and easily identified of tropical freshwater fish species.